Ravvi School of Yoga we offer 200hr and 500hr Yoga Teacher training. Here we wait for devoted practitioners who want to deepen their knowledge of Yoga Science. The teachers training course teaches you how to live a yoga lifestyle first and then be able to truly teach from a deeper part of yourself. The program is a life-changing experience. 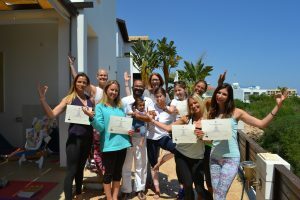 The course is designed to provide a sound foundation in developing skills in Hatha Yoga with the ability to teach, deliver and adapt practices in a supportive and encouraging environment. The purpose of this Yoga Teacher Training program is to provide a supportive environment in which students begin to connect with their inner teacher and internal wisdom. To provide the foundation on which trainee teachers can develop and evolve their physical, mental and spiritual well-being. The aim of this course is also to develop trainee teachers with the knowledge, skills and attitude to teach Yoga safely, confidently and professionally. The training will facilitate to deepen their personal asanas and meditation practice. We intend to support each student as they develop, deepen, appreciate and expand their understanding of their true authentic self. The aim is to produce Yoga Teachers who by taking responsibility for their own physical, mental and spiritual health are true ambassadors of the ancient system of Yoga. Further to engender excellence in the teaching methods of our trainees using the most up-to-date practice methods whilst maintaining loyalty to the classical yoga practices. The aims are realized through the basic study of philosophy, personal alignment, and modifications of classical poses, pranayama practices, and individual instruction. This intimate Yoga Teacher Training is sure to be a life enhancing experience. Teacher Training supports students in deepening their understanding and relationship to the practice by studying the basic ingredients: breath, locks and focus. With revolutionary methods to make the practice accessible and appropriate, our approach is modern, therapeutic, challenging, supportive and steeped in tradition. The teachers training course will guide students to establish and set up a business or for self-employment. Students are advised of sensible practice and of potential pitfalls. The course will provide you the art of teaching yoga which requires sensitivity, compassion, and understanding, as well as technical knowledge and years of practice and how an effective yoga teacher, in addition, should convey their innate love, which is the essence of yoga.